I’m a fan of the Brita® filtering pitcher. Years ago I tried a faucet mounted water filter made by another company and found it awkward and cumbersome. When Brita introduced the filtering pitcher I got one and I’ve been using it for over twenty years. Maybe ten years ago I added distillation to the process. Each run produces nearly a gallon of very pure water from over a gallon of tap water. What remains in the boiler is brown and ugly. After the distilled water cools it goes through the Brita pitcher for a final polish to remove the few remaining off flavors. It was a perfect system, until recently. 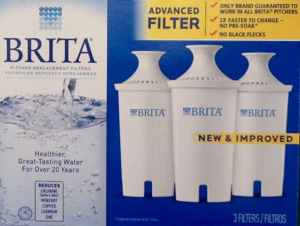 Late in 2015 the Brita filters changed. The new filters now have a truly useful handle on top that make inserting and removing the filter very easy. However, filter performance has declined. The new filter cartridge is called the Brita Advanced Filter. A sub-heading reads “Pitcher Replacement Filters.” The box says they are 2X faster to change and have no black flecks. A diagram on the back shows a new mesh screen on top that prevents black flecks. Personally, the black flecks don’t bother me. They are just stray bits of harmless activated carbon. They have no flavor and aren’t big enough to feel. Some people even take activated carbon as a digestive aid. Activated carbon absorbs and tightly holds impurities like chlorine, zinc, copper, mercury and cadmium. The original filter cartridges always worked very well. Sometimes I forgot to change them and they would stay in the pitcher for three or four months instead of the recommended two. No matter how long I used a filter, it always performed the same. By that I mean it would filter a quart of water in a short time, usually just a couple of minutes. I noticed a change in performance with the new Advanced Filters. After a few weeks it was taking longer than normal to filter a quart. By the end of a month, the filter time was up around twenty or thirty minutes. A few days later the pitcher needed hours to filter one quart. I could pick up the white upper half of the pitcher and see one small drop of water falling out of the pitcher every second or two. So I changed the filter and recorded the date on the box. I also started measuring and logging all the water I filtered with my pitcher. I should note that we use slightly less than one gallon of water per day in our house. While I was logging actual filter performance I contacted Brita customer support about the problem. 13 April 2018 – I’m testing an Epic Water Filters pitcher, which appears to be a superior product over Brita and I’ll post the results here on Helioza. Visit Epic Water Filters and use coupon code HELIOZA for 15% off your purchase. If you decide to buy an Epic product, I will earn a commission. If you don’t, I earn nothing. I’m doing these tests because I am disgusted with Brita and think the Epic products perform much better. Enter the discount code at checkout: helioza. Another way to end frustration with slow Brita Pitcher filters is to switch from filtering to distilling. A good water distiller produces pure water with virtually no contaminants. Bacteria cannot survive the distillation process and an activated carbon filter removes most chemicals that evaporate with the water.